Amy was First Diagnosed with Juvenile Battens Disease Aged 9 having been born Perfectly Healthy (although she will have had this condition from birth ) symptoms became apparent from aged 5 but only subtle differences that you couldn’t quite put your finger on Aged 7 She was Diagnosed with Bulls Eye Macular Dystrophy 11sept 01and 2 years later July 4th 2003 she was Diagnosed with Juvenile Battens Disease which has over time left her completely blind with complex epilepsy, myoclonus, difficulty with sleeping, feeding, toileting she is now completely reliant on care 24/7 and she is fed by a peg and requires a wheelchair for mobility and hoist transfers she also has Respiratory issues and Severe Scoliosis there is no cure for this condition and most Sadly lose their battle between early childhood and early Adulthood …Amy is now 24! We’ve tried hydrotherapy pools In the past but the logistics around that became difficult so we looked into having our own Spa which we researched thoroughly Amy loves It and the Benefits to Amy are that it relieves pain from muscle spasms, Improves her Circulation, helps maintain a range of motion in her joints, Helps relaxation and most importantly allows her freedom and being able to spend quality time with friends and family in an Activity that can be enjoyed by all. 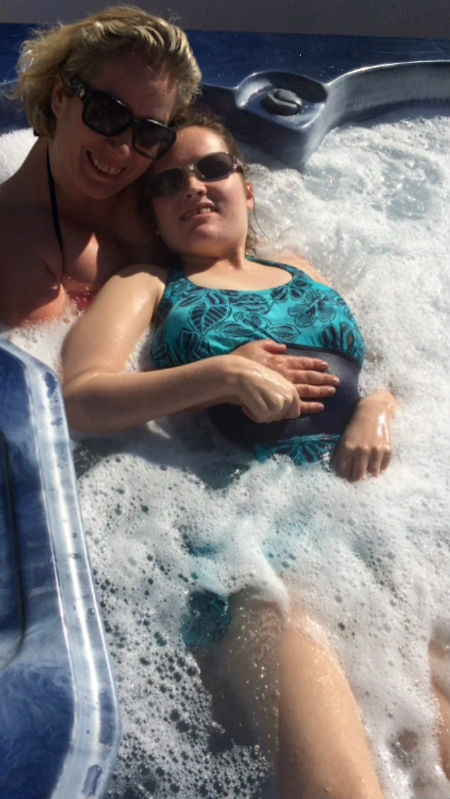 Amy uses the hot tub 3/4 times a week though it’s used by the family every day and is used by them for relaxation in between caring, Amy’s preferred seat is the loungers as she loves to feel the jets and the heat from the water and being able to float she is certainly more relaxed after using the hot tub I would certainly recommend it for health benefits to Anyone in a similar position it not only benefits Amy’s health but it’s a great social outlet that she wouldn’t otherwise have with friends and family This is Definitely our best purchase in regards to Amy’s health and well-being! 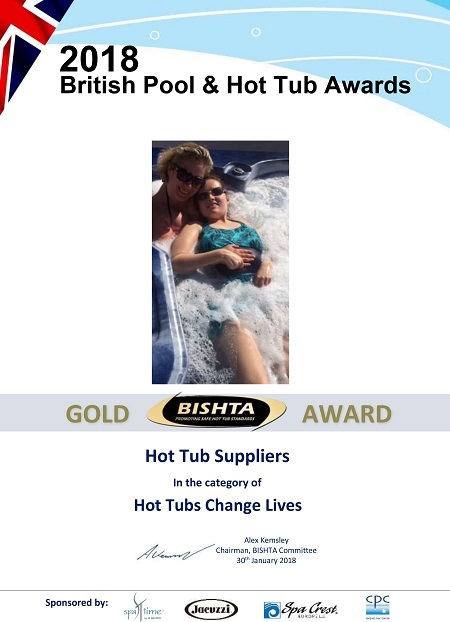 Amy is the current Gold Award winner at the British Pool & Hot Tub Awards 2018.